Jackson Asiku's prospects to regain a world title shot have been conclusively sealed after landing an International boxing fight. Australia-based Ugandan professional boxer, 32, Asiku alias 'Action' a former International Boxing Organisation (IBO) featherweight champion who switched back to the United Kingdom (UK), will on June 18, fight the Mongolian warrior Choi Tseveenpurey at York Hall Arena, Bethnal Green-London. The Mongolian has had no respect for African boxers, he previous beat Uganda's John Mackey, Abdu Tebazalwa and South Africa's Harry Ramogoad in the UK. Although, Choi with 30 (KO21) and 5 losses, is not new to humbling Ugandan boxers, Asiku 'Action' with 26 wins (KO14), 4 loss (KO1), has different plans as he promised to mark this fight as a success of recapturing the lost glory. "I can't reveal my plans," through an interpretor Choi told this reporter. “I've by now got the game plan; I have no reason to worry. I'll go in designed for him, make out what he's got and do what I've done here before,” Asiku retorted when asked if he's not afraid of the guy who has tormented other Ugandan boxers. 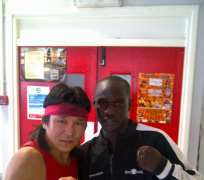 The 2000 Sydney Olympics Uganda's representative, Asuku will be back in the ring to regain the lost glory. He lost the IBO title to the Mexican Jhonny Gonzalez. The Ugandan lost the IBO title to the Mexican Gonzalez last September, at Hilton Hotel Arena, Las Vegas, Nevada USA. He insists that there is still much out of him to deliver to the world of boxing and silence his critics. Some of the most memorable iconic fights of Asiku include; the November 2009, when he stopped the......Heriberto Ruiz in the 8th round of the 12 rounds scheduled bout for the then vacant International Boxing Organisation (IBO) featherweight title at League Club Arena, Parramatta, New South Wales-Australia. This was one of Asiku's unsurpassed victories. Six months earlier, Asiku had packed down Junmar Dulog at Wyong Rugby Club Arena. Asiku's other target for the then vacant International Boxing Federation (IBF) was Gairy St Clair, who succumbed to a technical knockout in the 9th round of the 12 rounds scheduled bout. The Ugandan, Asiku, is not a novice on the English soils; he has previously bothered a couple of British boxers in crucial moments. Among his victims consist of; Marc Callaghan who suffered a debasing loss in the 1st round of the 12 rounds scheduled bout of the vacant Commonwealth featherweight title in November 2005, at Goresbrook Leisure Centre-Dagenham. Seven months later, Asiku defended the title in yet another remarkable action when he unleashed shocking blows that coerced Jamie Mckeever not to return to the ring for the second round of the 12 round scheduled bout, at Everton Park Sports Centre in Liverpool. Also Zambia's Saulus Kaunda succumbed to Asiku's knockout in the Africa Union featherweight title in Kampala. “This is the right time for Asiku to convince those doubting him. He made a commendable decision to switch back to the UK which is an atractive centre for boxing,” said Danny Lutaaya, a co-partner with Spencer Fearon currently managing Asiku. “ If Jackson beat Choi, it is a good comeback,” says Kutaaya. “The weekend will be a huge celebration for Uganda, because Kassim [Kassim Ouma] is also fighting in Panama,” said Lutaaya in reference to Kassim Ouma “The Dream” who takes on the Panama's Gennady Golovkin with, 20 (KO17) record, in the WBA World Middleweight title, at Arena Roberto Duran, Panama City.